Now just yesterday, 6th of April 2018, we received a government announcement that incentives for de-registration of old motorcycles, specifically those before 2003 were being handed out. 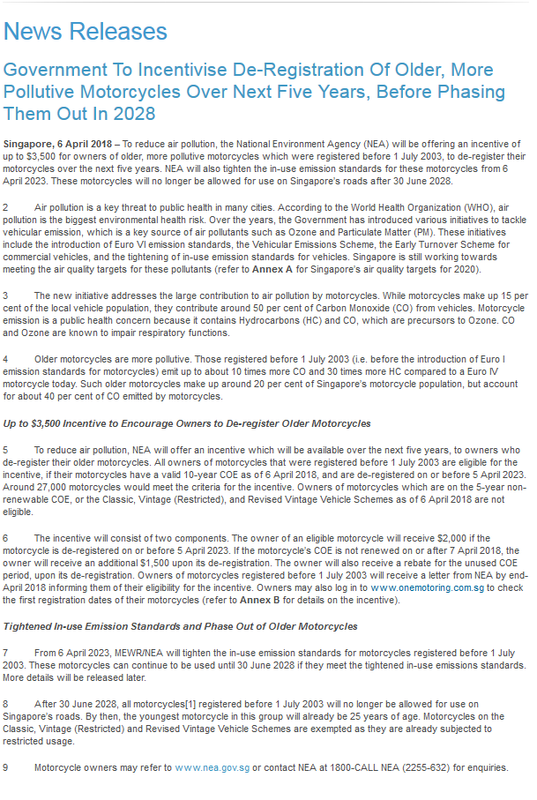 In the later part of the same announcement, came another piece of news, this one particularly bad, that motorcycles registered before 1 July 2003 will no longer be permitted on Singapore’s roads. What does this mean and how will it affect us? Let’s discuss. To understand the first part of the announcement, the incentives, because who doesn’t love money? Here’s 2 examples. An XR400 was registered on 7th August, 1997. with 10 year COE cycles, this means the last renewal was in 2017. If a 10 year COE was purchased on 6th August 2017, this XR400 will have a lifespan til 6th August 2027. De-registering this XR400 anytime within the next 5 years will get the owner a $3500 COE rebate, a refund of the outstanding COE and Road Tax, as well as the gratitude of happier lungs. Now let’s look at a Yamaha RX-Z, registered on the 17th of November, 1989. 10 year renewals of the COE would make this machine’s next round of COE due in 2019. 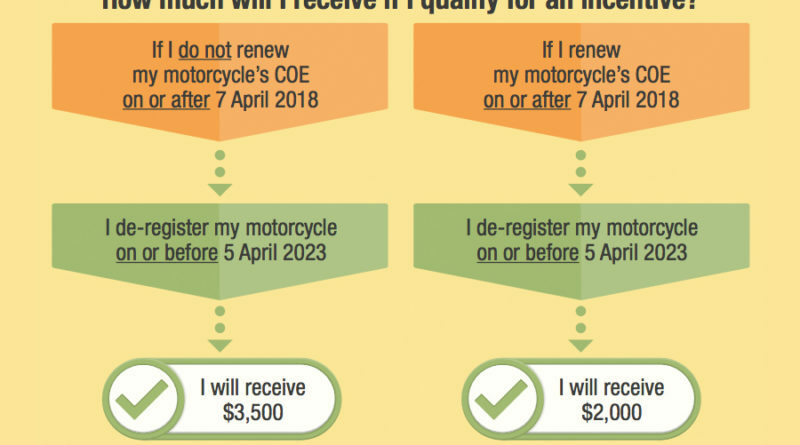 Should the owner choose to renew COE again on the 16th of November, 2019 and then de-register it anytime in 2021, the owner will receive the rebate for the outstanding COE, Road Tax and an additional $2000 for the de-registration. 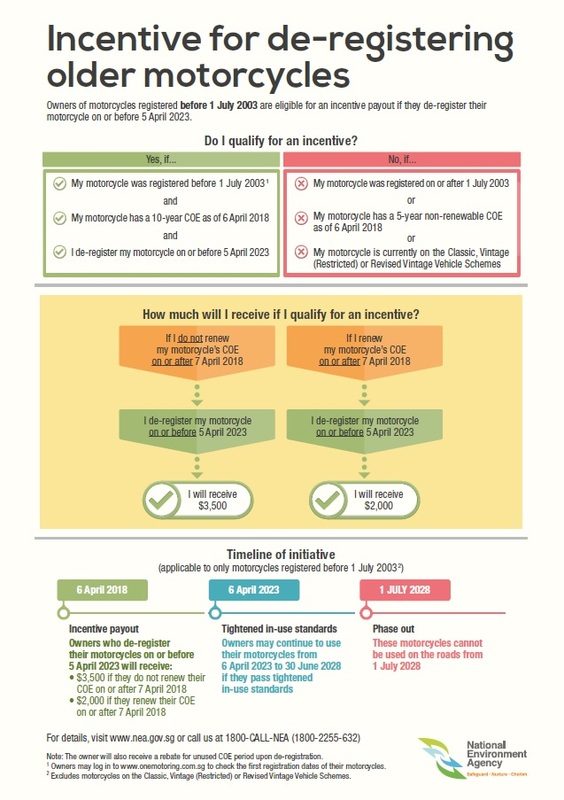 Should the owner opt for a 5 year renewal in 2019 instead, then there will be no incentive and he or she will only receive the COE and Road Tax rebate. How does this affect us? To some, like the older generation who may want to scrap their machines in view of the cash or others speculate by buying pre-2003 machines, this will be extra cash on hand. 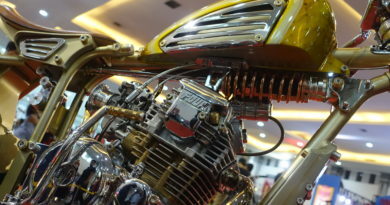 Dealers with a number of old and run down machines on hand can and will likely take full advantage of this to either scrap the vehicles, which returns more COEs to the pool for consumers in this zero growth environment or sell them to speculators at a higher price, thereby driving prices up across the board for all motorcycles to take a cut of this incentive for themselves. How much of the annual budget was set aside in anticipation of the de-registrations to follow however, remains unknown. 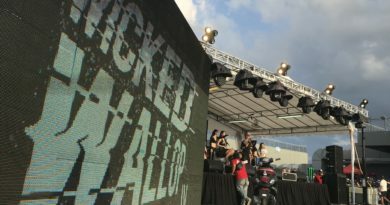 The more worrying part of the ruling, is that by the 30th of June 2028, all motorcycles registered before 1st july 2003 will no longer be permitted on Singaporean roads. With vehicles requiring a minimum of 35 to be registered under the Classic Vehicle Scheme, this means a whole generation of motorcycles between 1993 to 2003 will be lost. Even those owned by collectors. In the world of collectors and passionate motorcyclists like myself, this could be likened to nothing short of genocide. I’ll make a list of some notable casualties in a second part due soon. If you love motorcycles and the lifestyle, the list looks set to leave you speechless. 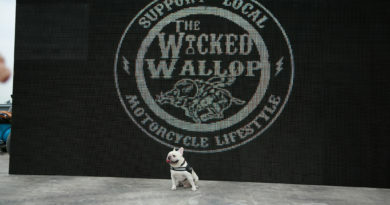 Think of it this way, the novelty in the annual fund raiser spectacle, The Distinguished Gentleman’s Ride diminished as the population dwindles. What is your opinion on this? Is there a more effective way to control emissions but at the same time provide an avenue for collectors and those who cherish their beloved motorcycles to retain them? Share, comment and present your alternative ideas, let’s see what other possibilities there are to move forward. How clean must air be? Who’s complaining from a national respiratory health crisis? What is the health impact of carbon monoxide vs impact of particulates (brake dust/tyre dust)? 30,000 motorcycles cross unregulated vis-a-vis CO across the Causeways daily and NEA chooses to impose its executive power where no resistance can be expected and without a basis for action. Follow saying as a small country it does not make much difference and now this year they gone overboard with policies which robbed our properties.
. Look at it this way.. These bikes are my assets so why must I scrape them for a pittance sum of 3500. It would have been better if they pay the market price if its a rare rc 30 or even a bimota tesi or Ducati MH 900. This high handed attitude just with a small monetary incentive is all their intellect can cook up to solve problems is a sad state of affair for us Singaporeans. Even if I were to agree with the pollution figures the bikes can be restricted without forcing us to Scrape our assets which is already an extreme measure in itself.. This is the doing of LTA and Nea and once again they have shown us how high handed they can be to just robbed us of machines that cost us a lot of money to buy and maintain.